CNN Wants to See More Female Altar Servers? 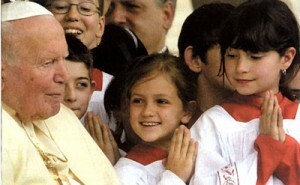 You are at:Home»Featured»CNN Wants to See More Female Altar Servers? Readers on my Facebook page got into a discussion one day recently about the CNN “Belief Blog.” The general consensus was that it’s actually more of an “UN-Belief Blog”: The point of the feature seems to be to identify a particular teaching or practice of the Catholic Church that is unpopular this week, then pontificate [an ironic word! ]about why it should be changed. This week’s column by Roland S. Martin on the topic of female altar servers (or “altar servants,” as he mistakenly calls them) is a case in point. Without knowing diddly about the Church’s long tradition, about the view of some that serving at Mass is an encouragement to young men to hear God’s call to the priesthood, or about the many roles which are available to Catholic women within the Church, Martin spouts off about “keeping women in their place” and “erecting barriers.” Were it not for women, he scolds, there might never have been Christianity. I’ve heard all this tired stuff before, notably from self-described “progressives” like Michael Sean Winters, columnist for the National Catholic Reporter. I am puzzled by the logic of those who suggest that women will be somehow damaged by gender-based restrictions, because that’s just not my experience. In fact, the opposite is true: If you believe that I can’t get beyond a male pronoun to understand that you’re also referring to me, a woman, then you don’t think much of my cognitive abilities. So what, exactly, is the advantage of having male altar servers? In a word: Vocations. At a time when there is a great need for young men to answer God’s call to serve as priests, service at the altar in this small way can provide the impetus to consider the priesthood. And there is correlative evidence to suggest that it works: Almost all ordained priests and deacons—adult converts excepted—were altar servers in their youth. And what, exactly, is the advantage of having female altar servers? In a word: Service. While women do not serve in ordained ministries, there is need for women and men to become more involved in ministries within the Church: as religious education teachers, Christian service volunteers, visitors to the homebound, and in many other capacities. Serving at the altar can help girls to feel more entrenched in the Church, and may prompt them to seek other ways to serve God within the Church when they reach adulthood. The debate about female altar servers was brought front and center in August of this year, when the Diocese of Phoenix announced that girls would no longer be among the altar servers at its Cathedral of Sts. Simon and Jude. Girls are encouraged to be sacristans—to help prepare the altar and the sanctuary for Mass. Father John Lankeit, rector of the cathedral, said that he had made the decision in an effort to nurture priestly vocations among the fifth- through eighth-grade boys who served there. Father Lankeit, in dividing the genders into two different “service groups” in the Church, is operating within the dictates of canon law. Before the canon law was revised in 1983, girls were not permitted to serve Mass; but even after canon law was changed, bishops and priests have always had the option of restricting the role to boys. Only one diocese—Lincoln, Nebraska—has established a policy of “boys only” for altar servers; and it’s noteworthy that the Diocese of Lincoln has had to build a new seminary to house all the young men pursuing a vocation and, according to the Official Catholic Directory, the ratio of seminarians to Catholics is higher than anywhere else in the country. Blogger Matt Bowman, writing a few months ago on the Catholic Vote site, made an interesting point regarding the people who decry the boys-only policy as anti-woman. They try to ram laity and gender inclusiveness into the altar because fundamentally they think clerical things are what matter most. The sacrifice of the Mass is the center of our lives as Christian lay people, but it is so by what we can all do at Mass–the prayers and reception of communion–in order to have union with God and take Jesus OUT into the world. It is not the center of the Christian life merely or even especially to the extent that we get up around the altar and play those liturgical roles. Ironically, liberal complaints along these lines are a rejection of the Second Vatican Council’s emphasis on the laity. When they call it a denial of justice if girls cannot be altar servers (or priests), they assume that only clerical roles are really important. Instead, “important stuff” for the laity means prayer, communing with our Lord, and then going out into the world. Altar service is important primarily as an experience for boys to get to know the role of the ministerial priesthood. As a convert I never had a chance to be an altar server, but both my sons have. Both are in their 20’s now but still treasure the memories they had while serving. I don’t have a problem with girls as altar severs, but I wonder what message we are sending to our young men and boys when the entire crew at Mass is girls. I feel quite strongly that men of all ages need to take a more visible and active role in the ministries of the Church. Men should be the spiritual leaders in the home. We as men need to show our spouses and children that being active in our faith is what real men do. So yes we may need to restrict just how much altar serving is allowed by girls. Dads now is the time for you to step up and encourage junior to serve at God’s altar. 1). If both your sons are not married, still encourage them too. If they are, on standby to fill in if their are no servers for Mass. I’m 51 yrs old and I still serve, it is a honor and privelege, and basically no one else does to some extent, especially at the Dominicans, they want members of the Lay Fraternity to serve, no outsider’s. Duty is what it is, duty to serve at the Altar. that he, the man is both male and female. Chapter #2 God puts Adam to sleep and basically woman is made for the man physically , thus also the spiritual aspect. Adam needed someone, not good for man to be alone, and also, Adam was no mental genisus, thus also needing a helpmate. 3). 1 Machabee’s chapter #8 verses 20 to 32. When readeing, praying, studying it, keep in mind what was taught in biology class about the human person ( male and female ). Since man was made into the imagae and likeness of God whole and complete before Eve, this is where Christ Jesus is with Himself when starting the Church and the Apostles, BEFORE the creation of Eve, thus women will NEVER be Priest’s, and why ONLY men should be serving on the Altar. ( Man was created for God, not women. Woman was created for man ). Had to re-read that section and pray, meditate on it quite a few times before understanding.